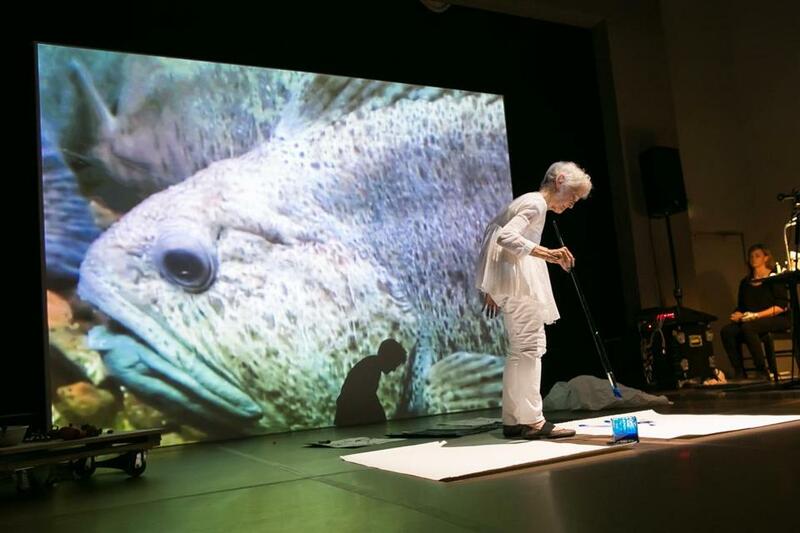 Joan Jonas performed "Reanimation" at the MFA. 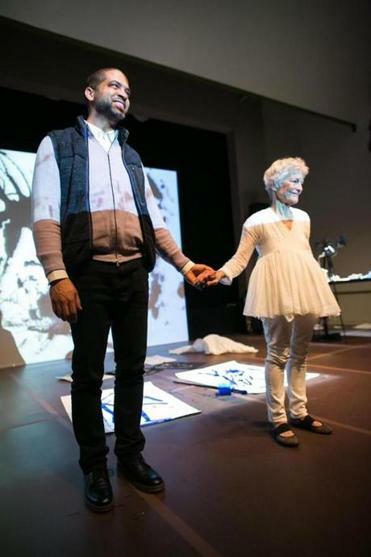 Jason Moran and Joan Jonas, after a performance of "Reanimation" at the MFA. Joan Jonas draws. She draws at an easel with a scrap of chalk or crayon stuck to a long stick. She draws with soupy blue paint on paper on the floor. She draws with ink and melting ice cubes, and projects that action on a large screen. Jonas, the legendary performance artist who will represent the United States in the Venice Biennale next year, staged “Reanimation,” an ambitious and soulful work, at the Museum of Fine Arts’s Remis Auditorium on Thursday. It’s the first major performance Jonas has brought to Boston, although she is a professor emerita at MIT, and MIT’s List Visual Arts Center is her presenter in Venice. “Reanimation” isn’t all about drawing. It’s also about climate change, and our questionable stewardship of the earth. It’s about myth and literature and the fountain of the human imagination. Jonas’s triumph is that in “Reanimation” she poetically elucidates them all, as she weaves them together in a swift, haunting visual tapestry. This densely layered piece deploys drawing, video projection, and passages read aloud from the novel “Under the Glacier,” by Halldór Laxness, the Nobel Prize-winning Icelandic author. Renowned jazz pianist Jason Moran (who is on the faculty at New England Conservatory) was on hand to perform his nimble, graceful score for “Reanimation,” which balanced piano with electronic sound. The video screen took center stage, constantly showing still and moving images — of melting ice, of mountains and horses and birds — and Jonas worked around it. She started out at the easel, drawing a network, white on black, as grainy, black-and-white floodwaters rushed by on the screen beside her. She moved across the stage to a table, where she drew beneath a lens that projected her gestures on top of a parade of still images on the screen. With more speed than finesse, she traced over those pictures in broad white lines. Images on the screen changed, and her drawing remained, layering abstraction or unlikely narrative onto the photographic picture below. Then she would discard that drawing and begin again. Her drawing brimmed with the urgency and insistence of leaving a mark — an echo of the first cave paintings. We can see that kind of raw gesture as a noble act. Or, against the occasional backdrop of melting glaciers over which Jonas traced, we can see humankind’s mark as having ballooned from a single chalky line to epic environmental degradation. At the same time, Jonas celebrates our capacity to create, offering up lucid morsels of human imagination. She quotes Laxness’s fantastical story about an Icelandic mountain glacier thought by locals to be the center of the world, stirring up an aura of magic, danger, and dark comedy with his words. As a performer, Jonas makes canny use of her body. Her early works back in the 1960s and ’70s were body-centric, often having to do with gender and fracturing the female form. Today, she’s a small woman in her 70s with snow-white hair. For “Reanimation,” she dressed entirely in white. The video projection took up more space than she did, but Jonas, and her actions, galvanized attention. She put on white masks with faces drawn in thick black lines (the first one looked like a jackal), and moved with a swath of white fabric in front of a screen brimming with melting ice. In the luminous blue hues of the projection, she looked severe and frightening, a messenger warning of what’s to come. Moran’s music escalated calamitously. This is not the first time Moran, who has collaborated with other visual artists, has worked with Jonas. The vitality of their partnership shone toward the end of “Reanimation,” when Jonas sat low to the ground, playing bells and rattles, with Moran softly behind her at the piano. She let the music carry her. Video projection followed the long shadow of a lone figure walking through a snowy field. The piano grew more urgent, and Jonas’s whole body moved with her hand instruments – she looked shamanic, as if she was invoking spirits. The shadow on screen continued to walk, a creature of rhythm leaving its ephemeral impression on the grass. There’s no clear story to “Reanimation.” Jonas fluidly stacks image upon image, sound upon sound, action upon action. The glue is in the associations she makes, and in the ones we make. In the end, the video quieted upon stern, slow fish near the sea floor. They looked primeval. Jonas was drawing again, this time in blue on white, spiky, four-legged images that might have been frogs, or birds, or people. In their jutting arms, I saw crucifixions. We’ve heard of creation myths. “Reanimation,” I thought, is a destruction myth, a song sung at the end of the world. But I had forgotten: Creation is always implicit in destruction. They go hand in hand. Jonas knows that, and “Reanimation” somberly, and sometimes joyfully, embodies them both.